As promised – massive discounts on MuscleHack products as a thank you for buying ‘Buff Baking’ and being a loyal customer (this offer will only be available to you for 1 week). 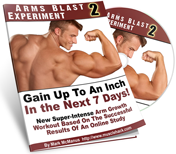 “Simply the best and fastest way to torch fat and get a sculpted six-pack”. Go here to see BEFORE/AFTER pics then come back here to take advantage of your discount code! “Volunteers gained up to 2.5 inches on their shoulders with brand new training techniques and a very specific type of training stress. It’s a brutal workout but everyone agreed…it’s a lot of fun!